This fun, family game lets players relive the three original Indiana Jones adventures. . . LEGO style. Along with whip-cracking, enemy-smashing action, there's plenty of madcap humor, lots of LEGO objects and vehicles to build and use, puzzles to solve, ruins to raid and secrets to discover—and naturally an awesome soundtrack as well! 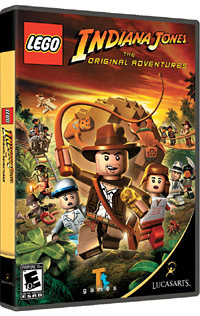 One warning: Like the other LEGO video games, LEGO Indiana Jones does not include a save-anywhere feature. In Free Play mode you can quit in the middle of a level and still save any treasures and studs you've collected, but in Story Mode you must complete each level in a single sitting. This can be a problem for some people—especially kids with limited patience or gaming time. The game begins with the first Story Level, Raiders of the Lost Ark: The Lost Temple. When you complete it, you can choose to continue with the next level or return to Barnett College, Indy's home base and the game's hub. From then on, you can access new and previously completed levels through the bulletin boards in the Main Hall at the college. There are two game modes in LEGO Indiana Jones: Story and Free Play. You must complete each level in Story Mode first to unlock it for Free Play. STORY MODE – As the name suggests, this is where you play through the events in the Indiana Jones movies in order. You control Indy and usually just one other character—someone who would normally appear in that sequence. In a single-player game, you can switch between those two characters by pressing the Free Tag button. In a two-player, co-op game, one player controls each character. Occasionally you'll have control of three characters, as in most of The Temple of Doom, when you control Indy, Wille and Short Round. There are several collectible items in LEGO Indiana Jones. These are described below. To check your progress during any level, just press Pause/Escape. This brings up the pause menu and displays the important items you've found so far. STUDS – Most objects in the game world release studs when smashed. Studs are used to purchase bonuses, such as Characters and Extras. The counter at the top left corner of the screen shows how many studs you've collected so far in the current level. There are various types of LEGO Studs, each with a different value: Silver: 10, Gold: 100, Blue: 1,000 and Purple: 10,000. Bust up everything in sight. Most LEGO objects that can be destroyed will release studs. Each time your character dies, you lose a few studs. In single-player mode, you can sometimes avoid this by quickly switching to the other character before the first character shatters. "True Adventurer" status can be achieved in each level by collecting a certain number of studs. The exact number varies for each level and is included in the walkthrough. The yellow stud meter at the top of the screen shows your progress. 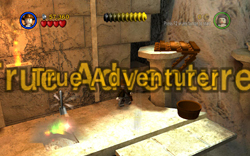 Once you've collected enough studs and filled that meter, the words "True Adventurer" flash across the screen. The meter then remains full even if you subsequently lose some studs. Getting True Adventurer for all levels is one factor in achieving 100% completion. HEARTS – Some items and enemies release hearts when they are destroyed. Hearts restore your character's health when you pick them up. WEAPONS - Indy's main tool and weapon throughout the game is his trusty whip. You'll never be without it. In Free Play you'll control characters with other weapons, and occasionally you'll be able to pick up weapons dropped by defeated enemies. These include spears, swords, crossbows, pistols, machine guns, grenades and even bazookas. When an enemy drops his weapon, you'll need to move fast to pick it up before it disappears. Borrowed weapons last for just a limited time. Once they've been thrown or run out of ammo, they disappear. Whip – Indy can use his fists or whip. To attack with the whip, stand near an enemy and press the Use button. Sometimes Indy will crack the whip, injuring his foe. Sometimes he'll use it to trip the enemy or pull him closer. Then you can punch using the Attack button. Occasionally he'll use the whip to disarm an enemy so you can use the stolen weapon yourself. Sword/Spear – These weapons can be used in close combat, by pressing the Use button, or as projectiles. To throw a spear or sword at a distant target, such as a rope that needs to be cut, face the target and wait for the blue reticule to appear. Then press Attack or Use to throw. Swords and spears can also shatter glass. Gun/Crossbow – Face the target and press the Attack button to shoot. Or, if there is a particular object that can be targeted, face it, wait for the blue reticule to appear, then fire. Guns can also break glass. Grenade/Bazooka – Aiming works the same as for other weapons; however, grenades and bazookas are powerful enough to destroy multiple enemies or blow up shiny metal objects found in some areas. TOOLS, KEYS & MISCELLANEOUS ITEMS - Some characters have abilities that allow them to do specialized jobs or access otherwise restricted areas, but even characters without special abilities can sometimes do these things if they have the right tools. The list below tells what various tools and objects do. See the Characters page for more info on Special Abilities. Shovel – Used for digging up buried objects in certain areas (or as a weapon). Look for sparkling areas on the ground, stand close and hold the Use button to dig. If you don't have a character equipped with a shovel, look for one nearby. Sometimes they are hidden inside breakable boxes, jars, etc. Wrench – Used to repair broken machinery (or as a weapon). When you see a machine with smoke and sparks coming out of it, grab a wrench, stand close by and hold the Use button to fix the machine. Again, if you don't have a character who always carries a wrench, try searching nearby to find one. Book – Some characters carry a blue book wherever they go. They are able to translate ancient writings and solve the hieroglyph puzzles you'll encounter in various levels. To do this, approach the puzzle carrying a blue book and press Use to activate it. Watch the pattern of hieroglyphs as they light up. Then activate the glyphs in the same sequence to solve the puzzle. When a character with the academic ability is not available, you may be able to find a blue book lying around. Key – Golden keys are used to operate crank mechanisms to open doors, raise bridges, etc. Keys are usually well hidden. So if you find a mechanism that doesn't work at first, try looking for a key. Torch – No character comes equipped with a torch. So if you need one, you'll always find it somewhere nearby. Torches are used to light dynamite fuses, set flamable objects on fire and ward off pests like snakes, spiders and rats. NOTE: Except for the tools that come with the character (e.g., Indy's whip, Satipo's shovel, etc. ), a character can usually carry only one object at a time. So picking up a second item causes them to drop the first one. If you need more than one tool or special item, you can always have the second playable character carry it. Vehicles – The game includes various vehicles. Some must be built or repaired before you can drive them. To use a working vehicle, hop in (by standing close and pressing Free Tag). Then just steer with the direction keys or left stick. Animals – A few LEGO animals (elephants, horses, etc.) can be ridden. Get on by standing close and pressing Free Tag. Steer with direction keys or stick. You can also use some animals to reach high ledges. Get on, maneuver your ride beneath the ledge and press Jump. The beast will then buck your character off its back, enabling you to get to places you could never reach on your own. Several feats are required in order to achieve 100% completion. For details and tips, check out the Xbox 360 Achievements page. Even if you're not playing the Xbox version, the requirements for the "Fortune & glory kid" achievement explains exactly how to get 100%.